12 well glass bottom plates are often used in experiments that need medium to large sample size. 12 well plate frames are made from virgin polystyrene. Quote: "HeLadox‐YFP‐TIARr cells were plated on a 12‐well glass bottom plate (Cellvis) and imaged at 15‐min intervals for 12 h on a Nikon Ti‐E microscope with an integrated perfect focus system"
Quote: "Cultured adipocytes grown and differentiated in 12-well glass bottom black plates (In Vitro Scientific, CA, USA)"
Quote: "10^5 BV2 GFP-G3BP1/mCherry-eIF3E Neo Puro cells were seeded on 12-well glass-bottom plates (Cellvis) in 2ml microscopy medium (phenol red free DMEM, 4,5g/L glucose, HEPES, L-glutamine"
Quote: "HeLa-TLR4 dual reporter cells were seeded on 12-well glass bottom plates (Cellvis, Mountain View, USA) at a concentration of 2.0×10 5 cells/ml in 1 ml complete medium per well and incubated for 48 h at 37°C." 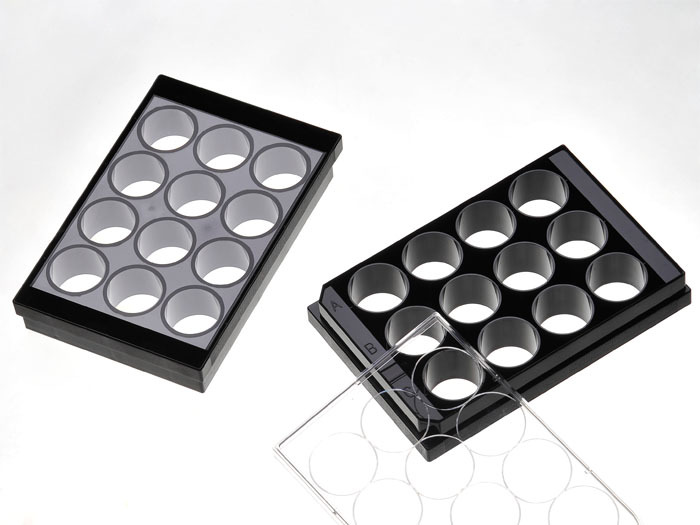 Quote: "Phagocytic assays: For phagocytic assays, cells were transferred to 12-well glass bottom plates (Cellvis, P12-1.5H-N) (1.5x105 cells/well)"
Quote: "Dueto the leakage of luminescence between wells in transparent plates and high background luminescence of white plates, we selected black plates from Cellvis (P12–1.5HN)"
View all 19 publications citing "12 Well glass bottom plates"